Building LGBTQ API power to amplify our voices and increase visibility of our communities. Through organizing, we inspire and train leaders, establish intergenerational connections, and document and disseminate our histories. Image description: JoJo is leaning against a wall, head tilted slightly and looking at the camera. JoJo (they/he) is an active APIENC volunteer and community leader. Jojo has brought their expertise on community walking tours to the Dragon Fruit Project Walking Tour and our Trans Justice Committee. More recently, they have helped create the graphics for our GROW Fundraising campaign! 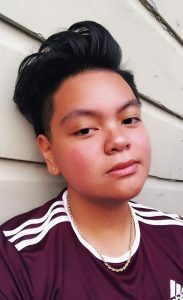 Outside of APIENC, JoJo, who identifies as queer, trans, and Filipinx, is a student at City College of San Francisco and works as a Community Health Worker. JoJo’s own life experiences of navigating personal and institutional challenges have led to who they are today and have influenced their community work. Before APIENC, they were heavily involved in other LGBTQ spaces throughout San Francisco. They learned what resiliency looked like and the power of community by engaging with people of diverse identities and experiences. Those experiences helped JoJo gain a deeper understanding of themself and what it meant to have pride as a queer and trans person of color. JoJo started volunteering with APIENC because they wanted to build community with other QTAPI folx. JoJo wants to see the LGBTQ API community uplifted through self-empowerment and liberation, especially in a world and in a time that attacks us with hate. Every interaction that JoJo has had, from meeting someone new to getting to know them better, has been memorable since they became involved with APIENC. Through the organization, they have gotten to know many leaders who do awesome work in the community and built meaningful relationships with them. This entry was posted in frontpage, Volunteer Spotlight by API Equality. Bookmark the permalink.